I can not speak English. Please forgive my poor English. 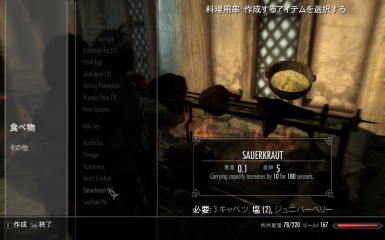 This MOD is append Nordic Style food. I use their resource MOD in this mod. I can not speak English. Please forgive my poor English. This MOD is append Nordic Style food. Pemmican is a portable(light weight) stew. You can recook it, when you like. Probably, it is help to playing "Frostfall". You can craft new foodstuff by Tanning Rack. You can try it at various restaurants. Now you can use this mod with Realistic Needs and Diseases. You must choice one main file set. 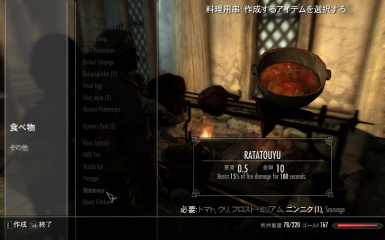 "Epicurism Of Skyrim_shopRNDpatch.esp"(ver0.3) has serious bug. Now you can play my MOD(RND.ver) only one esp file. Please delete "Epicurism Of Skyrim_shopRNDpatch.esp"(ver0.3) from your disc. Now you can remake Pemmican to stew normally. Now you(RNDusers) can buy new food item from NPC. They sell it in street stall or CandleHearth Holl. Some new food item are appended.